The settings available in the Color pane control the color of printed entities. The entities will be printed entirely in black. Shaded renderings will be in grayscale. The entities will be printed using the color used to display them on the screen. The color used is based on the entity's pen number (as specified in the Global Attributes dialog. 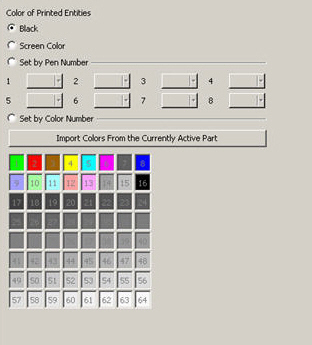 Click the color button to select the color for each pen number. The mapping from pen number to color uses well style buttons. If you want to change the color assigned to a pen number, click the downward facing arrow in each color box to display additional color choices. Click OTHER to open the Color dialog box. From here, you can create a custom color, set to any value in the 24-bit color spectrum, using a manual pick or by RGB or HSL values. The color used will be based on the entity's color number. Click the cell to select each color number. NOTE: The color palette displayed here is the same as the default display palette. Custom colors are set to any value in the 24-bit color spectrum, using a manual pick or by RGB or HSL values. If you select this button, the color palette will be updated to match that of the current .CKD file. NOTE: You can define colors in the Colors/Attributes pane of the File>Properties dialog. You can save any .CKD file as a .CKT (template) file, which ten you can use to create new files using all the settings defined in the File Properties.